Fort Leonard Wood, a military community located in the beautiful south central Missouri Ozarks and covers more than 61,000 acres. The fort is located in Pulaski County, which has a population of nearly 38,320. Bordering the installation to the north are the towns of Waynesville and St. Robert, with an estimated combined population of 4,937. The post is two miles south of Interstate 44. St. Louis is a 2-hour drive to the east along I-44 and Springfield, MO, is a little more than an hour's drive to the west. This vicinity is not a high cost living area, with all the mom and pop shops and great sightseeing areas. To learn and explore the history of Fort Leonard Wood there is a great historic museum located on post. You can also visit Fort Leonard Wood home page for more information. Fort Leonard Wood Garrison Command is proud to have 1st Engineer Brigade, 3rd Training Brigade, 14th Military Police Brigade and many more on the installation to make Fort Leonard Wood the #1 training. For further information on units look onward to Major Unit Listings. 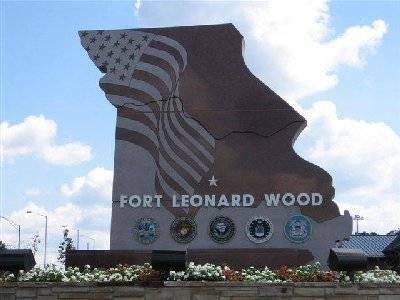 Fort Leonard Wood is located in the heart of the Ozarks off Interstate 44. The post is approximately 130 miles west of Saint Louis and 90 miles east of Springfield. Lambert-St. Louis International (STL) - 2 Hour Drive. Springfield-Branson Regional (SGF) - 1 hour 15 Minute Drive.